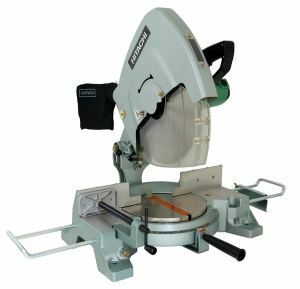 Most of the miter saws we review here on the site are corded models with just cause… You invariably get more power even if you are constrained by being tethered to a power outlet. Every once in a while, though, a great cordless alternative breaks the mold and delivers that perfect package of complete flexibility alongside flawless performance. 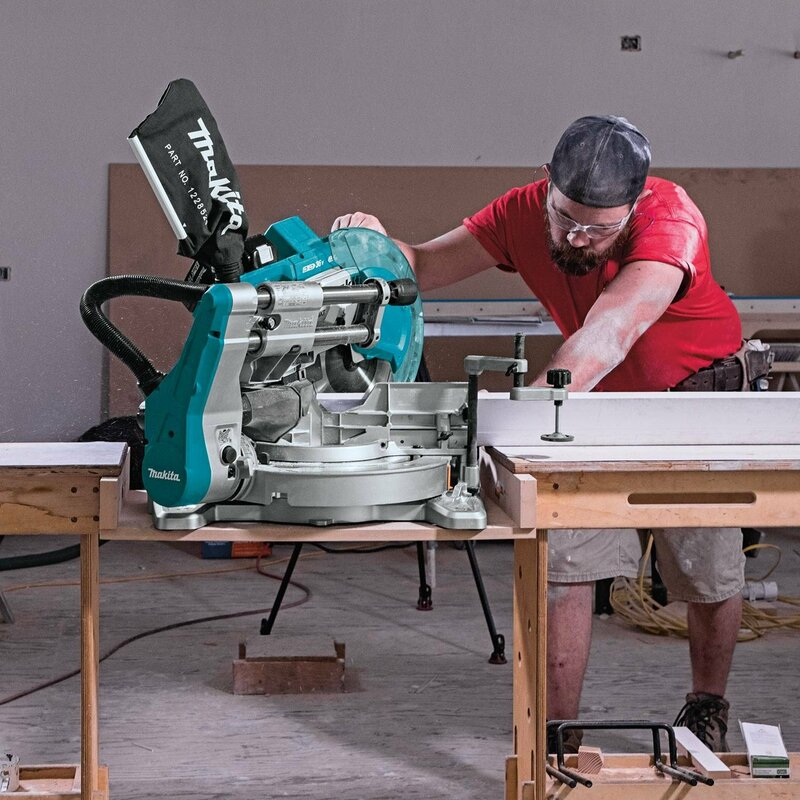 In today’s Makita XSL06PT 10-inch miter saw review, we’ll break down this fantastic sliding compound model so you can determine if it would make a wise addition to your workshop. 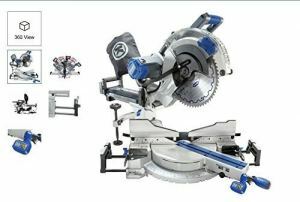 Amazing Miter Saw! The XSL06PT cuts very accurate, and the batteries last a really long time! I’m glad i got it. now there is sawdust friggin’ everywhere, but that’s what happens when you cut wood, especially with no real dust collection. the bag works ok i guess (there’s always sawdust in it), but obviously it would work much better if i used a vacuum. no fault of the saw though. 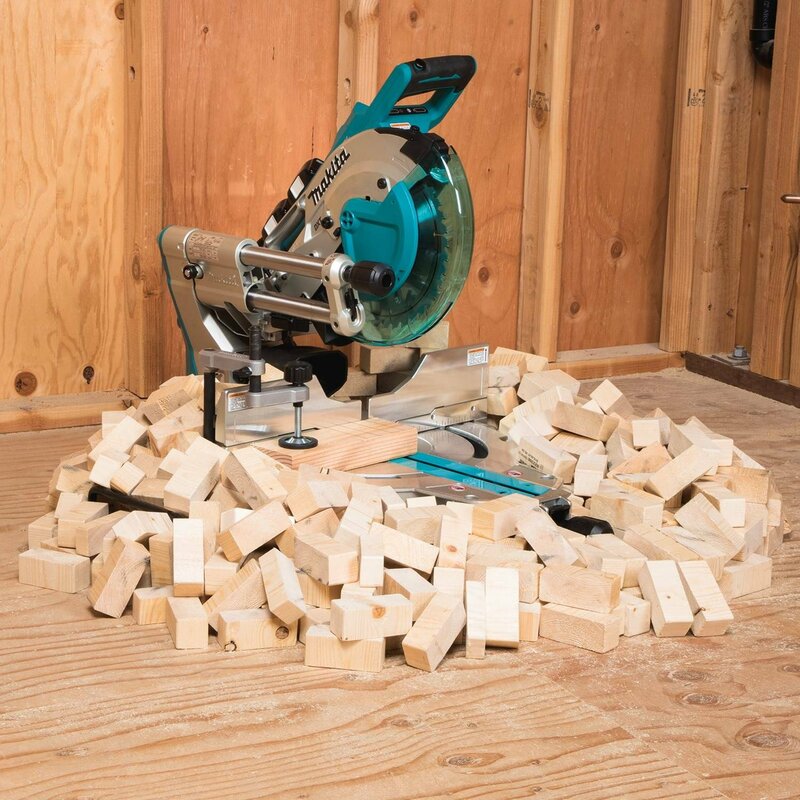 If you’re on the trail of a cordless miter saw, you might have spotted 10-inchers from the DeWalt and Milwaukee stables but we have to say the Makita beats them hands down. While they are more than serviceable alternatives, the highest praise we can give the Makita is that you’ll completely forget it’s cordless once you’re up and running rather than bemoaning a lack of speed or power. The brushless motor is the jewel in the crown of this hard-hitting 10-inch miter saw. A brace of 18-volt lithium-ion batteries serve up 36 volts of cutting power. The absence of carbon brushes means the BL motor runs slickly without any overheating. Effective power management means there’s no chance of the batteries overheating, overloading or over-discharging. The motor will run up to a highly impressive 4400RPM which is more than capable for most reasonable needs. Thanks to Automatic Speed Change technology, cutting speed and torque will be neatly tweaked to optimize cutting performance under load. If you’re cutting 2 x 4s, expect over 300 cuts before needing to break out the charger. 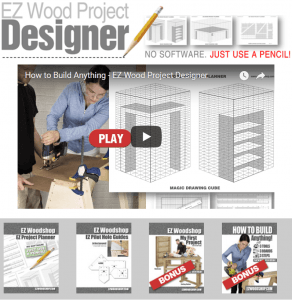 You’ll get 192 cuts if you step up to 2 x 12 timber. This is more than sufficient to offset the inconvenience of needing to take a break and give the Makita some juice. Without the menace of a belt prone to slipping, the direct drive gearbox boasting soft start technology leads to consistent and smooth delivery of power. The other advantage of direct drive motors is that they don’t degrade over time so your cuts will be just as tight and confident years down the track. The 2-steel rail system serves up single slide and glide functionality and allows you to position your miter saw tight against a wall if required. For such a potent saw, the Makita will occupy relatively little workshop real estate which is a wonderful bonus if you’re cramped for space like most of us are. Mitering to left and right up to 60 degrees, you’ll find the detents at all the expected angles. Everything slips into place and there’s not much danger of sliding over the stops unless you’re working at breakneck pace. Beveling is a pleasure with the Makita. There’s a knob you twist to lock things in place and its position front and center prevents you needing to contort yourself and reach around. The lever for releasing is rather less user-friendly and takes a bit of getting used to. You can adjust in either direction to 48 degrees. The 4-¾ inch fence is durable and offers ample support. This helps to really hone the accuracy of both miter cuts and beveling. The laser built in is a nice touch. You’ll have your cutting line clearly demarcated whether or not the blade is spinning. Dust collection is more than fit for purpose with a pair of ports and a dust bag included. Whether you opt for the bag or connection to a shop vac, ensuring your workshop is debris-free is crucial if you want to maintain a safe and hygienic environment. While you’ll get a decent 10-inch stock blade, the Makita arrives as bare tool so factor in the cost of the batteries when you’re budgeting. You will get a triangular rule and hex wrench chucked in but that’s the extent of the extras. A cordless miter saw is not for everyone but if you have an open mind and fancy trying something a little different, the Makita is highly unlikely to disappoint. 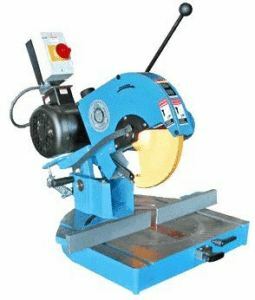 With exceptional cutting capability, long lasting batteries and a classic dual-bevel sliding system in place, this laser-guided miter saw merits a place in any home workshop. It will also serve as a convenient jobsite tool if you’re a contractor looking for the ultimate in portability and ease of use without compromising performance. If you’re still in any doubt, the fantastic 3-year limited warranty covering the miter saw, battery and charger should give you increased confidence. 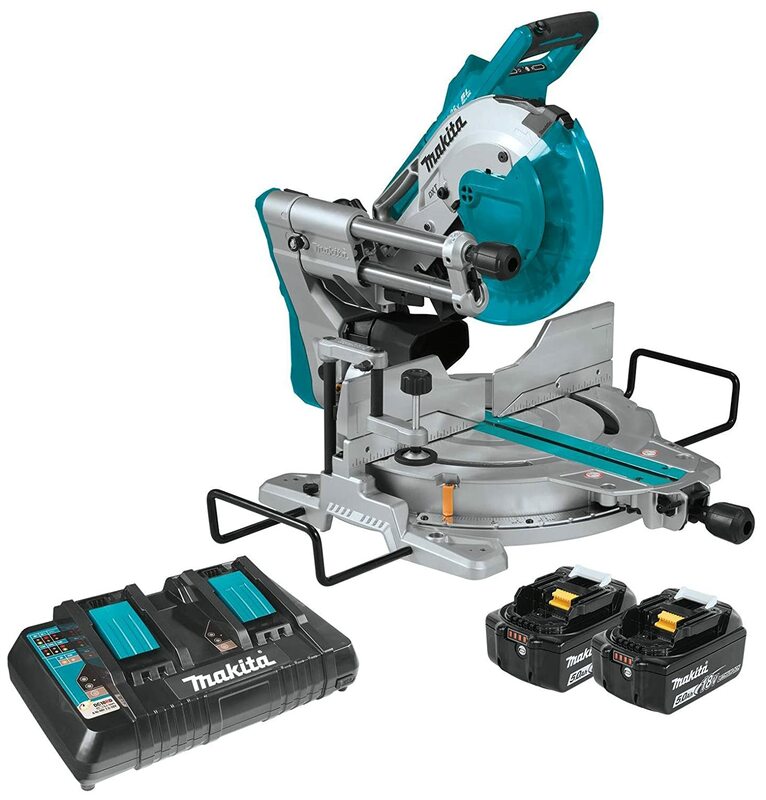 We really cannot recommend the Makita XSL06PT strongly enough. 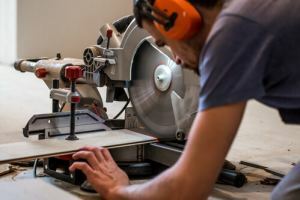 It’s a top-notch 10-inch miter saw which you’d barely suspect of being cordless. Check one out today and come back soon for the low-down on more first-rate power tools. Hi, I liked your article, so much information. You understand, apparently, in these questions, can you help choose a saw? I don’t know at all what details I need to pay attention to, how much a good saw costs, in general, I don’t know anything. 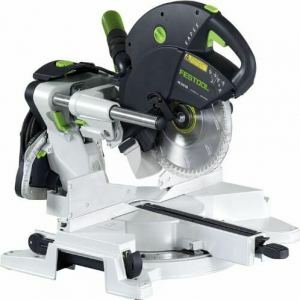 On the Internet, I got acquainted with some good saws, the one I liked the most was the Makita LS1221 12-inch Compound Miter saw Kit and the one you described, the Makita XSL06PT 10 “Dual-Bevel Sliding Compound Miter Saw. I don’t have enough money to To buy some of this, I need a budget option. For example, how would you rate this model Hitachi C10FCG 15-Amp 10 “Single Bevel Compound Miter Saw? In my opinion, it is good and inexpensive, which is very important to me. Hitachi is a very good budget mitersaw that will last years. It is good, durable, lightweight. A notch better would be dewalt dw715. It is a dewalt after all and always at discount. Something for you to consider. You cannot go wrong with either. Both are great without the need to break the bank.